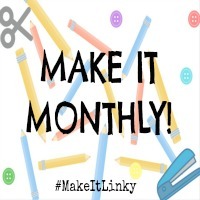 Book Of The Month is where my little ones & I focus on one book each month, read it, watch it (if possible) and do fun activities based on it! 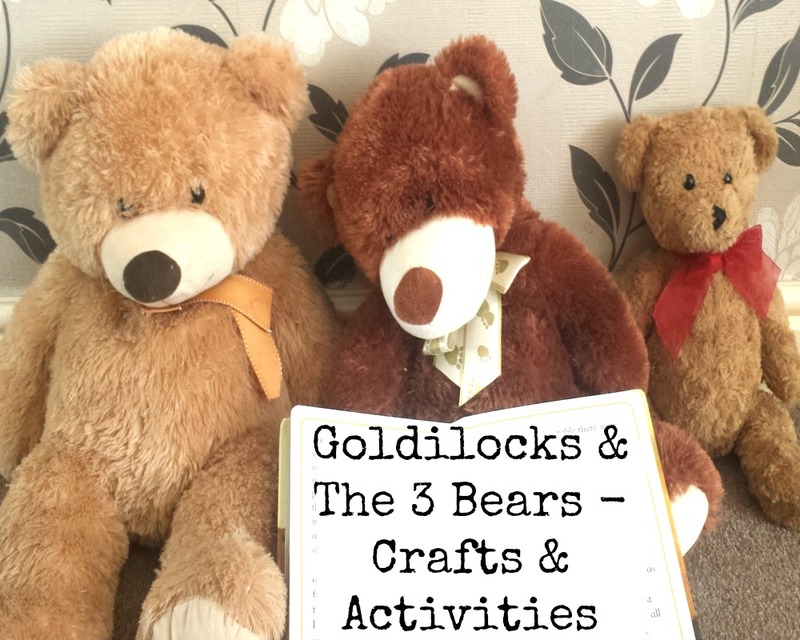 We decided to go for a bit of a classic this month, but we love it nevertheless - Goldilocks And The Three Bears! 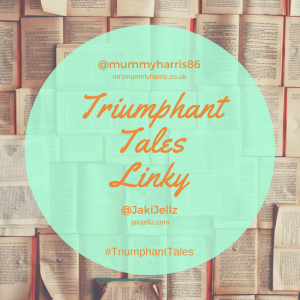 My little ones & I are really enjoying reading the good old fairy tales at the moment. We have a book of classic fairy tales for little children, as well as a lot of the ladybird fairy stories. (Did anyone else use to collect them?) So what better way to celebrate the classics than doing fun activities based on one of them! The first thing we decided to do was to find our 3 favourite toy bears, who could then be Mummy Bear, Daddy Bear & Baby Bear. They came at sat with us at the table while we did our first activity - Teddy Bear Toast! 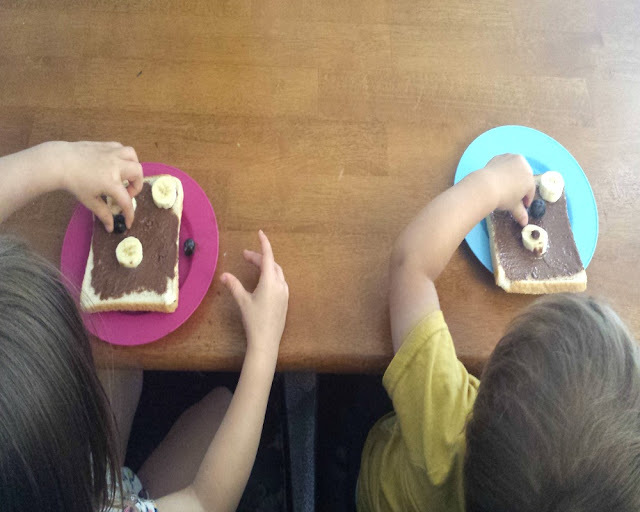 I've seen this idea on Pinterest before, but often using peanut butter, as my little ones aren't too keen, we used chocolate spread! 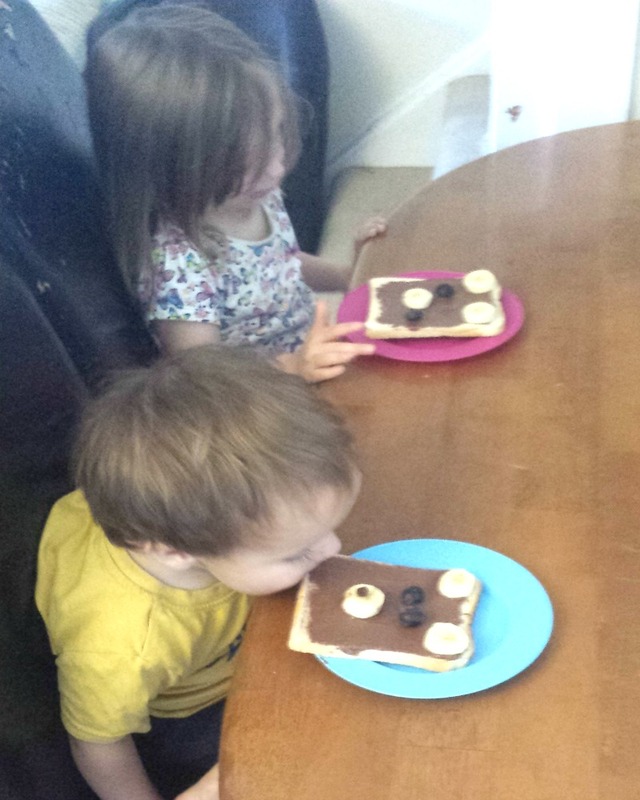 We cooked the toast and spread the chocolate all over it. 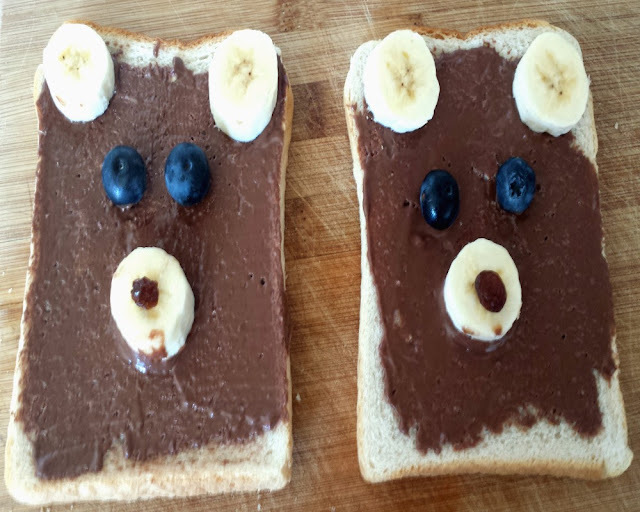 When the toast had cooled down a bit, we sliced some banana for the ears and snout and stuck some blueberries on top for the eyes and a raisin for the nose! I've never seen them eat fruit so fast! Haha. I may have made myself some too, and it was just right. 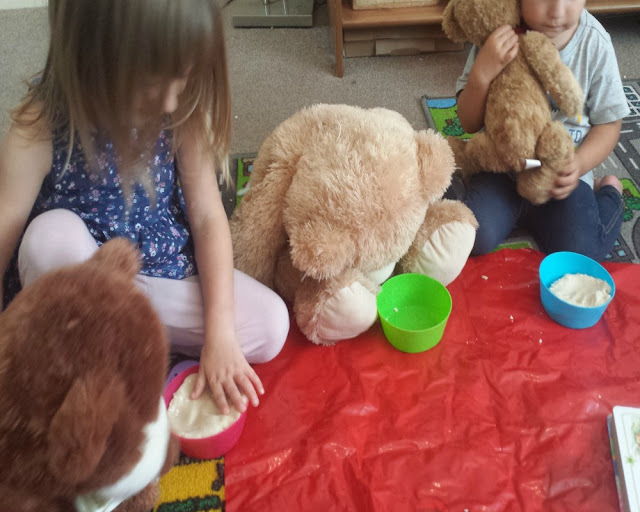 After scoffing down our snack, we headed back into the kitchen to prepare our next activity - Porridge Play Dough! 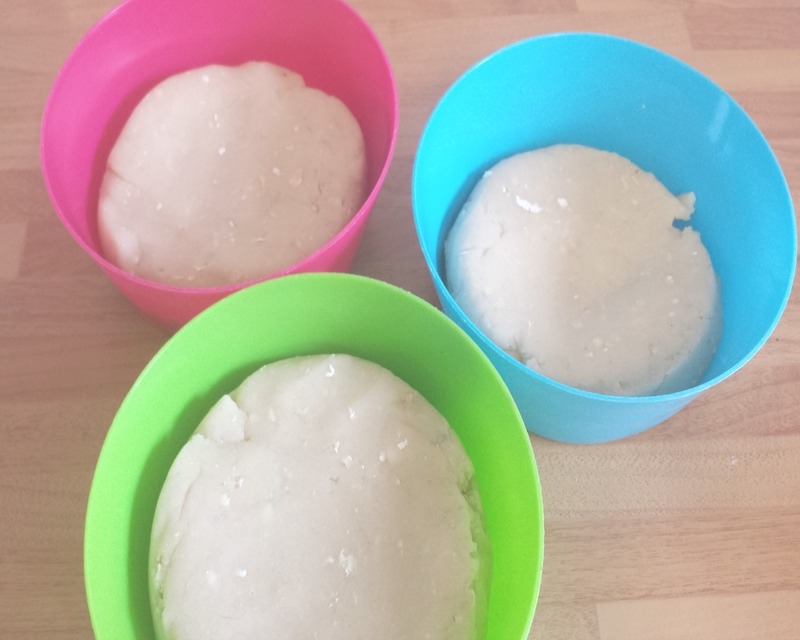 Mummy Bear, Daddy Bear & Baby Bear were getting hungry now so we used our good old DIY Play Dough recipe, but we didn't add any colouring, and we mixed up some oats into the dough! I have to say it did turn out pretty well! We had so much fun 'feeding' it to the bears, and cutting out funny shapes in the dough. 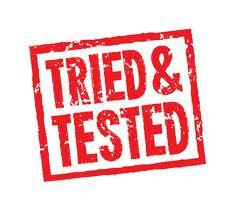 It's safe to say it went down well because we were playing with it for nearly two hours! When it was time to clear away the play dough, as I went out into the kitchen to wash up I heard the little ones acting out the Goldilocks & The Three Bears story with their cuddlies. It was so sweet. Then of course, at bedtime that night..we had to read the story again! Have you read Goldilocks & The Three Bears to your little ones?